February started off big for NBA Hall of Famer Shaquille O’Neal as he opened his first Los Angeles restaurant simply named Shaquille’s. It stands right next to the Staples Center where The Big Diesel helped deliver three NBA championships, with a Shaq-sized door for the big fella and other gigantic men to walk through. Other than the usual Southern menu it greatly boasts, there’s one dish that instantly grabbed the attention of those who’ve been in the joint. A certain name of a retired Laker, who worked his way to five rings for the franchise, popped out of the menu that starts with “K.” Of course, we’re talking about none other than the 20-year veteran, Kobe Bryant. We all know the historic run he and Shaq had with the Lakers that led to a three-peat from 2000 to 2002. But during those times, it was well-documented how the duo didn't get along. You can say that Shaq had a beef with Kobe. Sure, they were racking up highlights and wins every night, but their egos wanted to best each other. That led to Shaq leaving the team in 2004. Since then, however, with both guys now retired from the game, Kobe and Shaq have made up, with the latter even issuing an apology live on air via a face-to-face with his teammate. 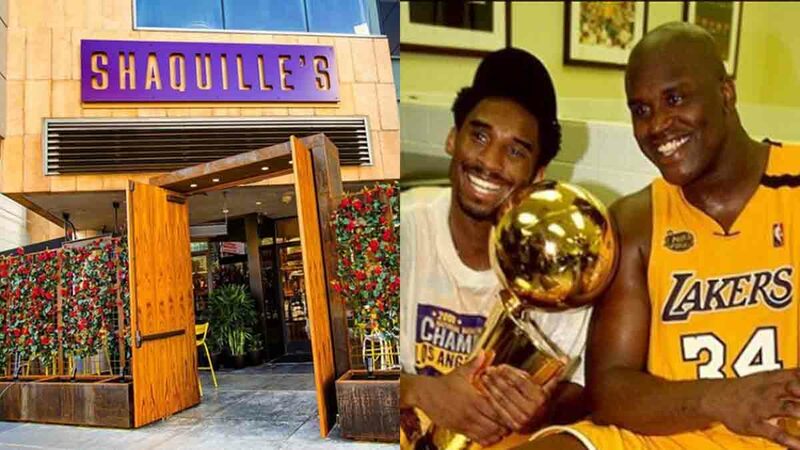 They could arguably be the best one-two punch in NBA history, and Shaq wanted to honor that in his new restaurant with only the two of them having burgers in the menu. So what’s in the Kobe Burger? Well, first off, the meat needs to be some prime Kobe beef (although we wished it was GOAT meat). It’s topped with some gruyere cheese, roasted tomatoes, wild arugula, and bacon jam. You can even have exactly (not really) 81 pieces of fries with it and pay tribute to The Black Mamba’s 81-point game. If we had the choice, we’d order a side of five (onion) rings to go with that, too. We don’t know about you, but we sure can’t PASS up on that burger.